Another newly redesigned area on the Gateway Arch grounds is now open – and it’s located just steps from the Laclede’s Landing MetroLink Station. Photo Gallery: View more photos of the North Gateway. The North Gateway opened two weeks ago and features new pathways, green park space and better connections to the Gateway Arch grounds from Laclede’s Landing, the St. Louis riverfront and downtown St. Louis. Even better, the new space is easily accessible now from the Laclede’s Landing MetroLink Station on the north end of the Arch grounds. You can access the new pathway area from either end of the MetroLink platform via North First Street or North Second Street. The National Park Service broke ground on improvements for the renovated park area two years ago, as part of the overall $380 million public-private CityArchRiver project. 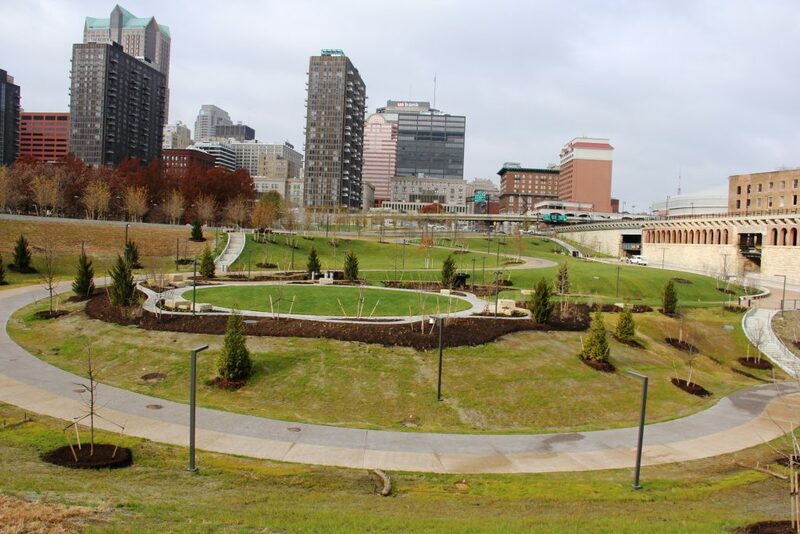 The new North Gateway section on the Arch grounds features a natural amphitheater area, shaded lawns, a bike and pedestrian path, the Explorers’ Garden (a landscape designed for children to play and learn) and a raised walkway. This is the same 7.5 acre area where the Arch parking garage was previously located south of the historic Eads Bridge. To help give the grass time to take root, some of the new lawn areas will be closed until next spring. CityArchRiver will hold a special celebration next year when all of the lawn areas and pathways are completely open. Major partners on the CityArchRiver project include the National Park Service, Bi-State Development, the Federal Highway Administration, the Federal Transportation Administration, the Missouri Department of Transportation and Great Rivers Greenway. Take Metro to check out the North Gateway and download the Metro On The Go app to your mobile device to plan your adventure. You can also use the online TripPlanner at metrostlouis.org or call Metro Transit Information, weekdays from 7:30 a.m. to 4:30 p.m., at 314-231-2345 or 618-271-2345.